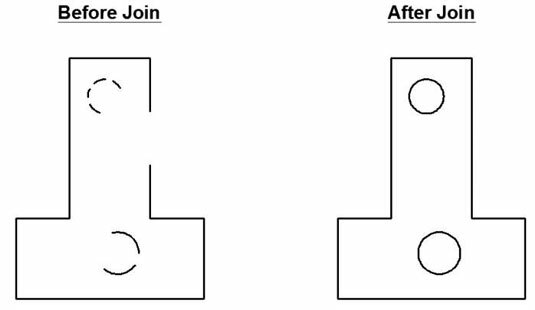 In AutoCAD 2014, you use the Join command to fill gaps between lines, arcs, elliptical arcs, open splines, 2D and 3D polylines, and helixes. If the lines are collinear (they lie in the same straight line) or the arcs, splines, polylines, or elliptical arcs are on a similarly curved path, Join creates a single new entity to replace the existing separate pieces. Objects to be joined must be collinear or else their ends must be coincident. You can’t join noncollinear objects that have gaps between them or that cross or overlap. Click the Modify panel title at the bottom edge of the Ribbon’s Home tab to open the Modify panel’s slideout, and then click the Join button. If you foresee doing a lot of joinery, you can pin open the slideout. AutoCAD prompts you to select the source object. Select the source object — that is, the object you want to join other objects to. Select valid objects to join to the original source object. For example, if you selected a line as the source object, AutoCAD continues prompting for additional adjoining lines until you press Enter to end the object selection. AutoCAD joins the selected objects into a single object. The new object inherits relevant properties, such as the layer or linetype of the source object. You aren’t limited to selecting a single object at the first prompt. If you select multiple objects by using windowing, Join joins whatever objects it can and rejects those that it can’t. You can turn an arc into a circle or an elliptical arc into a full ellipse with Join’s cLose option.